Betrayed America and almost ruined its brand. Remember New Coke? If you do, then you probably remember how mad people were about it. 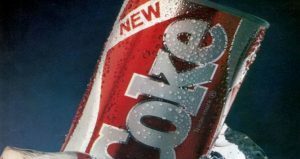 It was like a movie wherein Coca-Cola Classic and his wife, Diet Coke, gave birth to the Rosemary’s Baby equivalent of soda; or it was like a daytime soap opera with a murder that gets blamed on Coke, but the perpetrator is actually Coke’s heretofore unknown twin brother, New Coke. Now that’s how you start an article about brands. The point of this metaphor-addled reminiscing over New Coke is this: The Coke brand was imperiled because someone decided to introduce a new product with a similar name to the company’s flagship title. The Coca-Cola Company would have been better off naming New Coke any other name that did not have the word “Coke” in it. So why did New Coke anger so many people and Diet Coke caught on in popularity? The reason is because the word Diet is inoffensive, and, generally speaking, the word Diet in relation to sugary products is a joke that everyone is in on…and that’s why it’s not funny. Visit You the Designer for more tips on ways to screw up your brand…and don’t follow those tips. Still don’t trust yourself with a brand? Contact Cindy at Cimetta Design; she’ll set you straight. Image Source: New Coke Must Die.